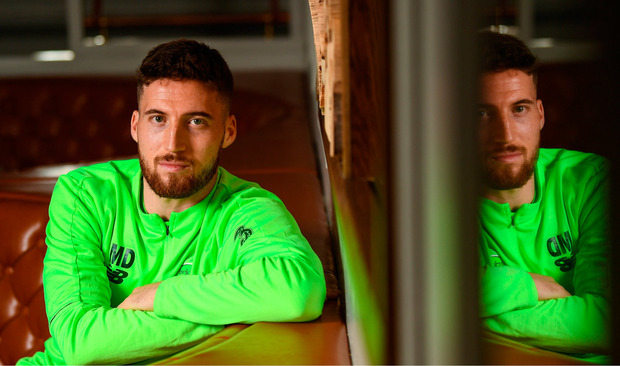 Matt Doherty has proven himself as a Premier League player. And he's a top-flight interview too. Footballers are frequently accused of offering up bland, anodyne statements that reveal nothing. Tough questions are fudged, or batted away diplomatically. Players and managers that have fallen out will pretend that everything is rosy - until they have an autobiography to push. Doherty is different. His father, Tom, tells him to be careful. "Watch what you say, watch you say," says Doherty, grinning as he mimics the parental tone. But in the same breath, he takes issue with the suggestion that telling it like it is might be a bad thing. "What have I said wrong?" he shrugs. The subject, in this instance, is Doherty's decision to spill the beans on Martin O'Neill and Roy Keane in the aftermath of his departure. "I've gone onto that radio station before but I had cancelled on them a few weeks before so when they asked this time around I thought, 'Oh I don't want to cancel on them again,' so I went on it," he explains. "The timing was probably not the best. That's the one thing I regret, the timing. It was too soon." He pauses briefly. "What did I even say again?" he asks. "You said too much", says an FAI press officer, speaking up from the back of the huddle. Doherty had struggled to get a look-in under O'Neill and there had already been a back and forth in the press over the player's belief that his face didn't fit. In that radio chat, he described the Derryman's methods as "old school" and said that "with Ireland, you didn't really have that much coaching". He described players going out onto the pitch with no real idea of the team shape or how they would play and could offer no answer when pressed on what Keane brought to the party. "I guess he was Martin's assistant," was Doherty's memorable response after lengthy deliberation. In his defence, he pleads honesty. "I think in my head, 'Don't say it' but it just comes out anyway," he sighs, "I just don't know if I can stop myself from saying it. "But that's why I'm here. I'm here to answer questions that you ask me. If you ask me a question... I'm not a liar so I'm not going to try and get out of the question. I just answer it. "The answers I give, they shouldn't cause too much trouble unless people take them the wrong way. Whenever I say anything, I don't lie. I'm speaking the truth so I guess maybe I should disguise what I say more. But why should I lie for no reason?" These are the type of statements that would make PR handlers wake up in a cold sweat. Doherty missed the memo on media training, but then he did have some experience in the real world before leaving Bohemians to join Wolves in 2010. And there is no suggestion that a rise in his profile has affected his performance. If anything, it's driven him on to new heights. Doherty has operated below the radar during the bulk of his stay in England, but he has taken the Premier League by storm this year and earned a new contract that has given him long-term financial security. He chuckles when asked if he's keeping a record of his goals and assists. "I'm not keeping track but I've got six goals and seven assists," he responds. "Of course you keep track of it. I want to know how I'm doing and contributing. If anyone says they don't... they're lying. "My confidence is sky high and probably never been higher. We're seventh in the league, in the semi-final of the FA Cup, and for our first season in the Premier League we can't ask for anything more than that. "Obviously we could win the FA Cup and there's a pretty good chance we could do that - but we have to beat Watford first and they have beaten us already this season - but the way we're playing at the moment, we'd back ourselves to beat anyone." Before that, there's Irish matters to address. He does view this as a fresh start for his international career given the aforementioned difficulties with O'Neill. McCarthy knows what he can do, and Doherty likes the 60-year-old's straight-talking style. It's possible that the Swords man will have to adapt to a slightly unfamiliar right side of midfield role, and he acknowledges that will pose some challenges. "It would be different and it would still take a bit of getting used to, in the defensive phase, but I'd be totally happy to play there," he says, adding that an alliance with Seamus Coleman could have benefits. "We're pretty similar," he elaborates, "Our games involve little one-twos, clever play, not always just running past people down the line. We see each other as a bit smarter, that's how we like to play the game. If that's the case then it should work on Saturday." Either way, he anticipates that any tactical discussions with McCarthy will be amicable. His view that the atmosphere is better around the place naturally leads to questions on the contrast with O'Neill. "It's just a different type of management personality," he summarises. As he prepares to leave, his commitment to truth is tested by a direct query about the reported phone call from O'Neill to discuss his 2FM comments. The story goes that it was angry and abrupt. Doherty smiles again. "Thanks lads," he says, rising from his seat after exchanging glances with the press officer. Through his silence, he'd given the answer.